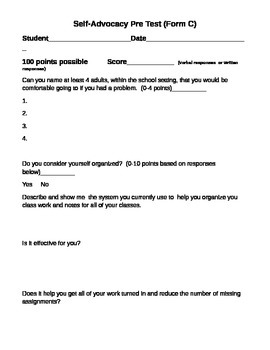 For use with students diagnosed with ADD, ADHD, Autism Spectrum Disorder or students who struggle with the executive functioning skills necessary to be successful in the school setting and beyond. 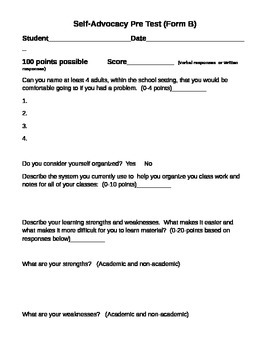 Included in the A-B-C-Self Advocacy Goal Kit are three, comprehensive, measurable self-advocacy goal forms for the middle or junior high school student. 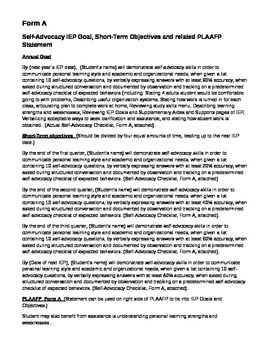 Each Kit Includes everything you need to write an appropriate self-advocacy goal for a middle or junior high school student; including a student pre-test, Annual Self-Advocacy IEP Goal with four measurable Short-Term Objectives, a recommended PLAAFP statement and a Self-Advocacy checklist for easy data collection. There are 3 progressive self-advocacy goal kits included – Forms A, B, and C. These three sets of forms include self-advocacy goals and objectives that can follow the student through three consecutive years of school (and three consecutive IEP’s). Form A - Recommended for the elementary students who will be transitioning to the middle or junior high school within the IEP year. Form C – Recommended for the middle or high school student who will be transitioning to the high school within the IEP year.